Hi friend! Happy month of June! Summer is just around the corner, which means you’re likely looking to get a little more fit and feel a little more fine. I want to help you get started with my three part series on Stopping Self-Sabotage: Overcoming Your Resistance to Healthy Eating ( one, two, three). Today I want to share some practical information in the form of basic suggestions for foods to avoid in order to promote optimal health and your perfect shape (whatever that may be!). 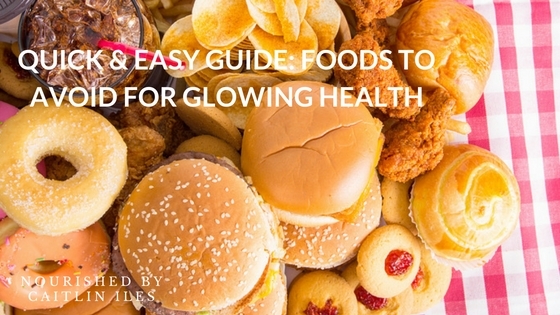 It’s hard to look and feel your best when you’re swimming in chemicals and preservatives or fighting off chronic inflammation so without further ado here is my simple list of Foods to Avoid for Glowing Health. Refined flours have had all the nutrients removed from them, which means they actually cost your body nutrients in order to digest them. They also tend to be very high in carbohydrates, which can cause spikes in your blood sugar and lead to inflammation, mood swings, and cravings. They include: Corn, Cotton, Soy, Peanut, Canola, Safflower, and Sunflower Oil and most come from seeds. These are the most common “vegetable oils” found on the supermarket shelves and marketing geniuses have done a pretty good job at convincing the public that they are heart healthy. These claims are misleading as most of these fats have a much higher ratio of omega-6 to omega-3 fats, which can cause inflammation in the body. Traditionally, nutritionists and scientists agree that you should be consuming these fats in a ratio of about 1:1 to 4:1, with slightly more omega-6 in the diet. However, when you consume huge amounts of vegetable oils that ratio can get as high as 20:1 and thus a favourable environment for inflammation is born. Another reason you typically want to avoid these oils is due to the process by which they are extracted and produced. It typically takes about 7 steps to produce vegetable oils and during this process chemical solvents such as hexane or heptane (substances made from crude oil) are added to extract the oil from the product. They then go through a process of heating to ~150F, which can destabilize the fatty acid structure and make it more likely to cause inflammation. Next the oils are degummed, refined, bleached, deodorized, and may have preservatives or defoamers added. This process of production leaves you with an oil that has been stripped of virtually any nutritional value and is much more likely to cause illness than promote health. It is for all intents and purposes, dead. Unsaturated FAs and EFAs are heated to 248-410F in the presence of a metal catalyst, usually nickel but sometimes platinum or copper, for 6-8 hours. The nickel catalyst is usually made up of 50% nickel and 50% aluminum. Remnants of both of these metals are left in the final food product, which you then eat. Gross. Completely hydrogenated fats contain unnatural fatty acid fragments, hydrocarbons, and altered fatty acid products, which can be potentially toxic to your body. Partially hydrogenated fats, which include margarines, shortenings, shortening oils, and partially hydrogenated vegetable oils, are even worse in that they go through the same process, but it is not brought to completion and so the final product contains trans-fats, in addition to many (dozens!!) other potentially harmful intermediate substances. These bastards are virtually unrecognizable to the body and highly toxic. They can increase blood triglyceride levels by up to 47%. High TGs are a predictor of heart disease and atherosclerosis. It should come as no surprise that you want to eliminate as much of these dangerous fats from your diet as you can to live as healthfully and happily as possible. Added sugars account for a ridiculous amount of our dietary calories and can lead to a host of health issues such as heart disease, metabolic syndrome, weight gain, acne, eczema, hormonal imbalances, and obesity. Avoid products that use high fructose corn syrup and agave as they are high in fructose, which is almost instantly turned to fat in your liver and can lead to the development of Non-Alcoholic Fatty Liver Disease. Artificial colours have been linked to behaviour issues in children, so it’s not unlikely that they would have similar affects on adults. Preservatives, and other unpronounceable chemicals, are not recognized by your body as food and so need to be detoxified, which places an extra burden on your already busy liver. They may have been tested in isolation and small doses, but rarely are preservatives ever tested in conjunction with different ones (as they often appear in our products), so you literally have no idea what the long-term impact of ingesting many types of preservatives on a daily basis will have on your body or your liver. Commercial baked goods are often not only full of refined flours, sugars, and unhealthy fats, but will also typically contain a whole host of preservatives to keep them “fresh” longer. Avoid them like the plague. Many preservatives are made from petrochemicals, which can cause confusion in the body and a possible immune system response. If it’s made in a lab, it’s probably best to keep it off your plate. Artificial sweeteners have been shown in various studies to promote weight gain and fat deposition. Some sweeteners, such as aspartame, have been linked to neurological issues and other adverse reactions, such as increased headaches. Well friend those are some of my most basic suggestions for foods to keep off your plate. A good rule of thumb is if you can’t pronounce it or if the ingredient listing has more than 6 items (not including spices) you should probably just put it back on the shelf. Stay tuned for next week when I share some of my favourite Foods to Love! Have a wonderful week! If you enjoyed this topic, make sure you download my FREE Stop Self-Sabotage Workbook by clicking here. Read the rest of the series below!